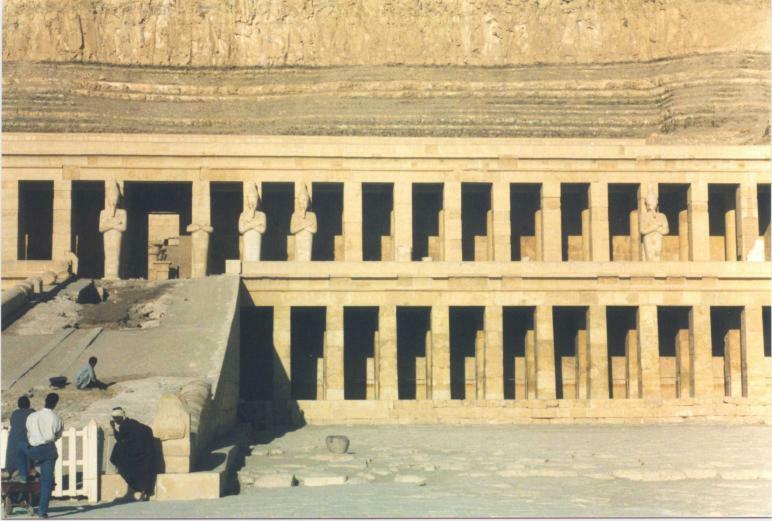 Frontal view of the "Mortuary Temple" of Hatschepsut ("Throne name "Maat-Ka-Ra"; 1498 - 1483 BC) at Deir al-Bahari. 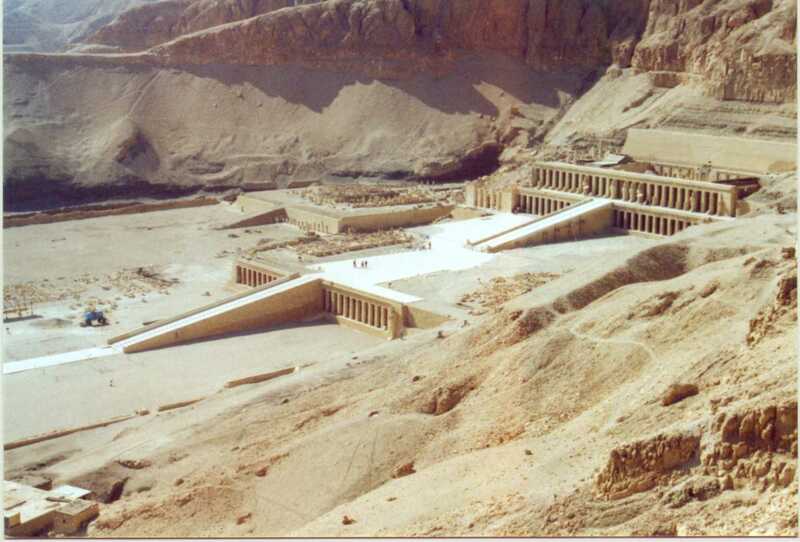 Since several years the temple is excavated and partly restored by egyptologist from Poland. 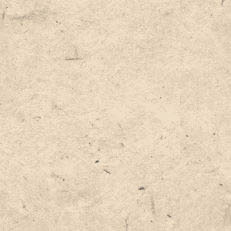 This is expecially discernible at the 1st ramp that leads from the valley floor upwards to the 2nd level of the temple. The 2nd ramp and the 3rd level are still under reconstruction and can not be visited at the moment. 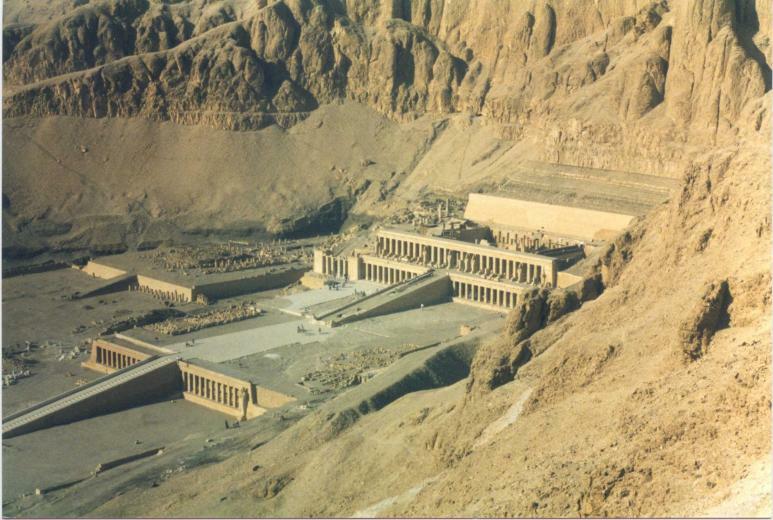 As far as possible the raised statues on the 3rd level showing Hatschepsut as Osiris were reerected. 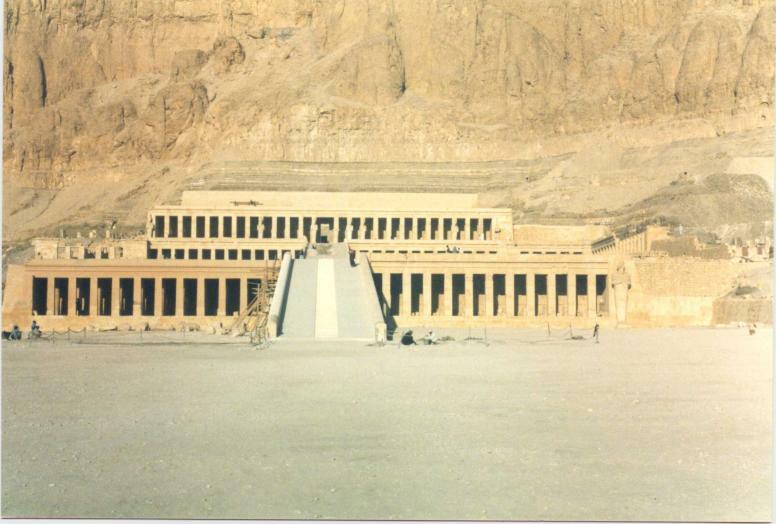 The progression of the restauration can be seen in comparison with picture above taken in December 1999. The 2nd ramp is ready now. The entrance to the 3rd level is still prohibited. 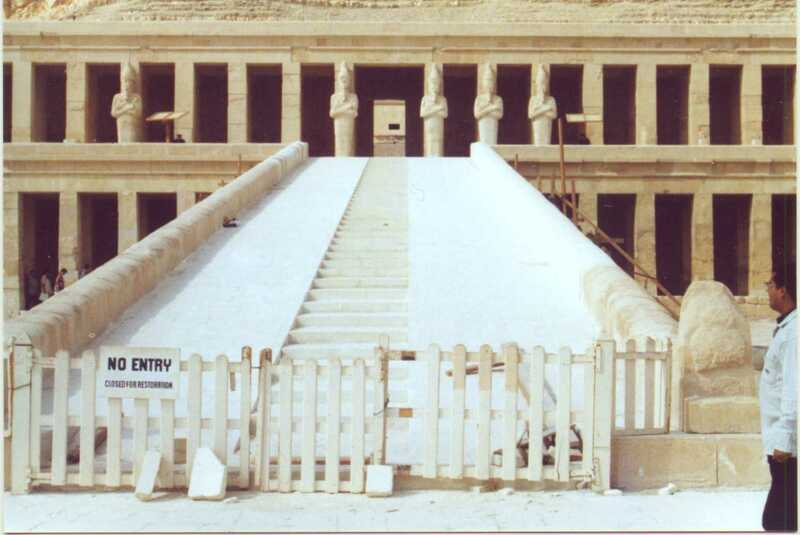 Beside the 2nd ramp, restauration also continued on the 2nd court (see in comparison the picture above taken in December 1999). 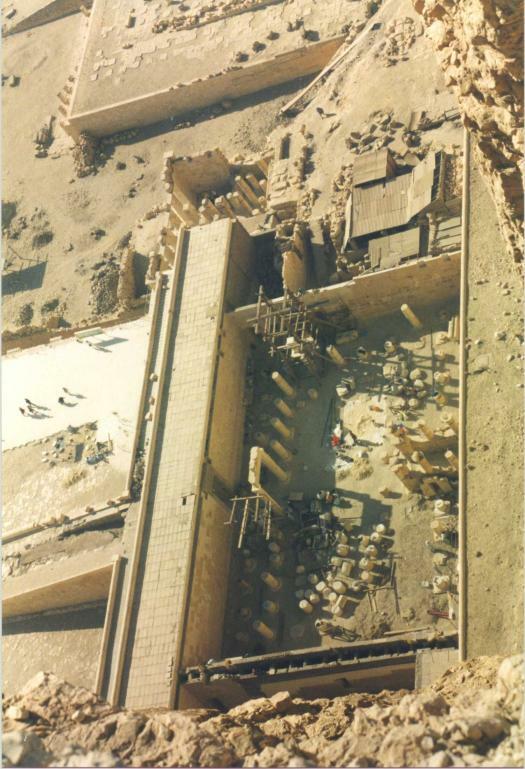 On the left side before the 1st ramp the remnants (stumps) from the incense trees brought to Egypt from Punt can be seen fenced in a small area. Main part of the temple viewn from the old workers trail. 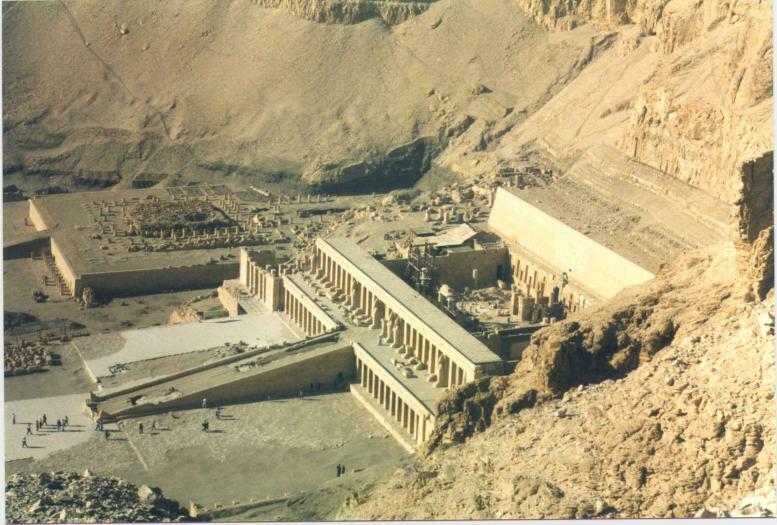 Top down view from the surrounding hills directly into the hall of collumns were the polish egyptologists are working currently.